Three Wreath Ceremonies were held during the last month …..
Alfred Handley of the Royal Army Service Corps. 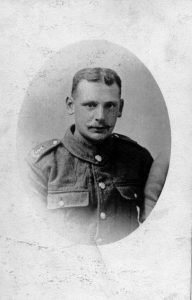 Whilst researching Alfred Handley’s Soldier Story it was realised that his younger brother Private Tom Robinson HANDLEY, of the North Staffordshire Regiment, had been killed on September 29th 1918. He was buried at Aisne in France but we included his story at the grave side of his older brother and markers were placed together for both men. During March the following Ceremonies will take place …. Formal confirmation has been received that the CWGC is reviewing the sixteen cases of names on the Batley War Memorial who were not included in the Official List of WWI Casualties – we were advised that the review will be held in the near future. At the same time as the Batley list was compiled it was established that two men were buried in St. Peter’s Churchyard, Birstall who had not been included in the official records. As Roland Pride died after the official cut-off date – August 31st 1921 – he cannot be included in the list of official war casualties. Ernest Pollard’s Soldier’s Story and background has been fully researched and a submission has been made to CWGC to have his name included in the official list. One of the project team – Stephen Walker – is a Friend and Helper at Birstall Library and acts as our project man on the ground. He heard from a proud father that his son had written a poem about WWI during his school work. Stephen asked that we add it to the Project BUGLE website. The food is raw and canned. This will be the first month in over four and a half years where we have not published a Newsletter. For the future we will issue a ‘Latest News’ statement to keep you abreast of latest developments. For Driver Alfred Hadley of the Royal Army Service Corps. From the date of the signing of the Armistice a further 66 soldiers deaths were recorded on the Batley War Memorial. From research this seemed a high number compared to the WWI graves in Batley Cemetery for the same period. A detailed analysis highlighted that sixteen soldiers were buried in the Cemetery, recorded on the War Memorial, but were not added to the official CWGC Casualty Register. 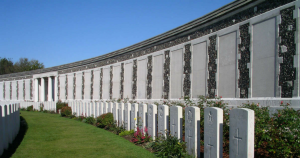 We have taken the matter up with the CWGC requesting a review. All of the men were discharged and returned home. Some never served – they signed on but failed the medical when they were called up. Some lived many years after discharge and died of everyday causes – flu being the most prevalent. Whilst all situations will be reviewed special consideration has been requested for seven on the list. They all served more than one year including service on the frontline. Further developments will be advised in due course. The January Edition of the BUGLE Newsletter and the Poppy List are now available on the website and the Exhibitions in Batley and Birstall Libraries. 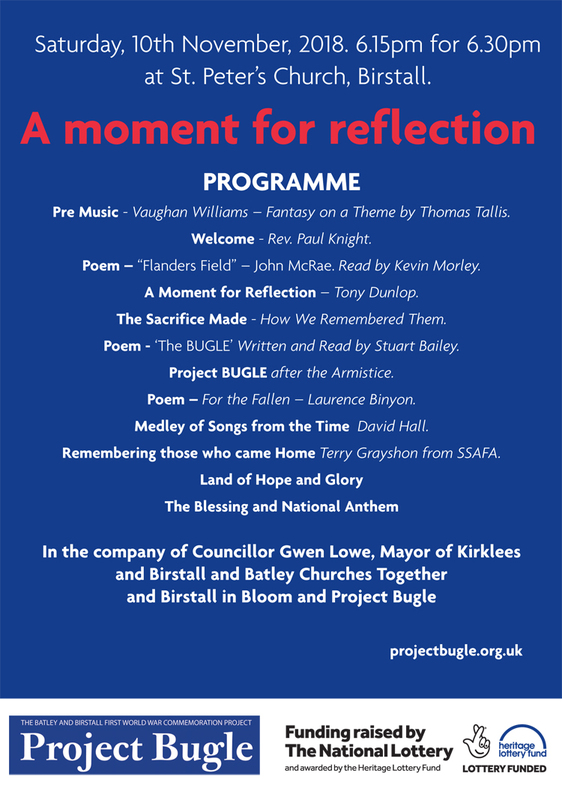 This will be the 54th and final monthly edition of the “Project BUGLE Newsletter”. There will be five special issues of the newsletter over the coming months and details will be announced shortly. The Exhibitions in Batley and Birstall Libraries will continue until the end of June 2019 to coincide with 100th Anniversary of the signing of the Treaty of Versailles – bringing the formal political end to the war. At this time we would like to thank the staff of both Batley and Birstall Libraries for their help with the monthly Exhibitions and the distribution of the Newsletters. The Exhibitions will now include a POPPY LIST of all the soldiers who died after January 1st 1919 and are named on the Batley and Birstall War memorials. Also included will be the schedule of Wreath Ceremonies planned for 2019. These will be held on the 100th day/year anniversary of the soldiers death through to October. There will then be four Ceremonies outstanding which have anniversaries running into 2020 and 2021. We therefore plan to hold these four Ceremonies on Remembrance Day November 11th 2019. This will then complete the commitments made in the Project BUGLE intentions. The December Edition of the BUGLE Newsletter and the Poppy List are now available on the website and the Exhibitions in Batley and Birstall Libraries reflect the situation in December 1918. Although the armed conflict ended over three weeks earlier six men from Batley and Birstall died whilst on Service. In fact over 50 men died over the following couple of years as a result of injuries received during the War. The main activity over the last four weeks has been the Eve of the Armistice ‘Moment for Reflection’ gathering at St. Peter’s Parish Church. It was a special evening and thanks go to those who look took part and particularly to Rev. Paul Knight and his team at the Church. Thanks also to the ‘Birstall in Bloom’ team for preparing such a beautiful floral tribute and to The Mayor of Kirklees and her Consort – Gwen and Ken – for joining our event and staying after to talk to so many who attended. Although the Armistice was signed on November 11th 1918 – and the fighting stopped – the political end of the war didn’t come until June 1919 with the signing of the ‘Treaty of Versailles’. I fact over fifty local men died as a result of their war efforts after the date of the Armistice. The January edition of the Project BUGLE Newsletter will be the last produced in the monthly series. There are plans to produce another five or six special editions under a group series of ‘How We Remembered Them’. The Exhibitions will continue in both Batley and Birstall Libraries. We will continue in 2019 to hold the Wreath Ceremonies on the 100th day/year Anniversary date for those who were buried locally. The last one falls in October. Thereafter there are four anniversaries that occur in the following two years. 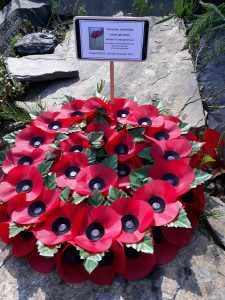 Wreath Ceremony for Private Clifford BRUCE of the Cameronians (Scottish Rifles) at Batley Cemetery on December 28th 2018 at 10.45. Meet by the Chapel. The November Edition of the BUGLE Newsletter and the Poppy List are now available on the website and the Exhibitions in Batley and Birstall Libraries reflect the situation in November 1918. During this month there were TWENTY-SEVEN losses from Batley and Birstall. This month in 1918 marked the beginning of the end of World War One and the 2018 BUGLE November Newsletter has the headline ”THE WAR IS OVER”. The announcement was made on the eleventh hour of the eleventh day of the eleventh month of 1918. The Germans signed the Allies Armistice at 5.00am on that morning. Whilst this was planned to be the end of the hostilities it wasn’t until June 28th 1919 that the political end was achieved through the formality of the Treaty of Versailles. Wreath Ceremony for Private Joah MORTIMER of the Durham Light Infantry at Batley Cemetery on November 13th 2018 at 10.45. Meet by the Chapel. Wreath Ceremony for Sergeant Fred GREENWOOD of the Royal Warwickshire Regiment at Batley Cemetery on November 13th 2018 also at 10.45. Meet by the Chapel. 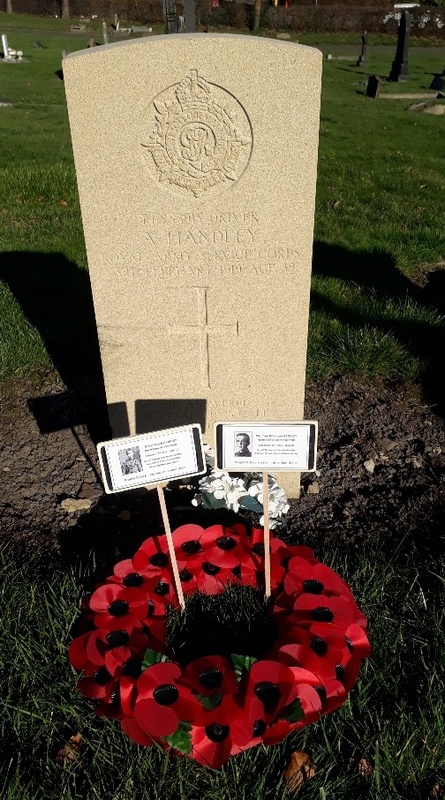 Wreath Ceremony for Gunner Edward CHADWICK of the Royal Field Artillery at Dewsbury Cemetery on November 13th 2018 at 12.00. Meet at the top gate on Burgh Mill Lane. SPECIAL RESEARCH by Ken Fedzin. With the end of hostilities declared, Ken has researched the two soldiers who were the first and the last to be ‘killed in action’. A new book has just been released that links the First World War with the world of Rugby – League but as it was then ‘The Northern Union. Local Historian Jane Roberts, and her husband Chris, have produced an extremely well researched and superbly presented book “The Greatest Sacrifice – The Fallen Heroes of the Northern Union” — many a Christmas present solved!! 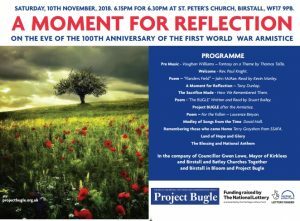 Plans are now complete for the special event to be held at St. Peter’s Parish Church, Birstall on Saturday November 10th – the Eve of the WWI Armistice. I’m delighted that we will be joined by the Mayor of Kirklees, Councillor Gwen Lowe. The October Edition of the BUGLE Newsletter and the Poppy List are now available on the website and the Exhibitions in Batley and Birstall Libraries reflect the situation in October 1918. During this month there were FIFTY FOUR losses from Batley and Birstall. Full Soldier Stories for …. 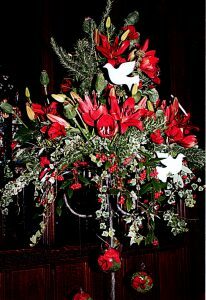 There are ten Wreath Ceremonies during the month and the details of the dates and times are shown on the website in the EVENTS SECTION. Pleasing to report that the project has come through the stage review of the projects achievements against the objectives we set out and HLF have completed a full audit of how we spent the first £8,500 of the Project BUGLE grant. We have now received the second stage grant of £7,500. Additionally the HLF have agreed to our request to extend the project through to the end of 2019 and they will fund the spend through to the end of the extension. This will allow us to complete our ambitious plans and also add a few new features to our ‘legacy’ intentions. A date for your diary – Saturday November 10th at 6.30pm at St. Peter’s Parish Church, Birstall. Remembrance Sunday this year coincides with the 100th year Anniversary of the ending of the conflict of the First World. On the eve of that Anniversary we plan to collect to take time to reflect on the last four and a half years of WWI. To remember those lost but also to remember those who returned – many wounded in body and well as mind. I am please that both the local MP and the Mayor have accepted invitations to join us. Full details in the November release BUT WRITE IT DOWN today. The September Edition of the BUGLE Newsletter and the Poppy List are now available on the website and the Exhibitions in Batley and Birstall Libraries reflect the situation in September 1918. 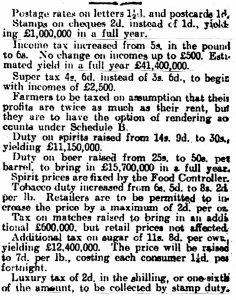 During the August there were FORTY losses from Batley and Birstall. Wreath Ceremony – included in the above stories is that for William Kelly. Although he enrolled in 1915 he wasn’t called forward until June 1918 by which time he was found to be quite seriously ill. He was discharged in early September and died at home on September 12th. He served just one day in uniform. His was regarded as a civilian death and he wasn’t included in the War List of Casualties but his name is on the Batley Memorial. The Project Team will lay a Wreath on his grave at 11.00 am on September 12th at Batley Cemetery. An open invitation is extended to those who wish to join us. The next full Wreath Ceremony is at Batley Cemetery on October 8th. There are in fact EIGHT Wreath Ceremonies locally during October and full details will be on the website shortly. In a couple of cases we are holding Ceremonies on the same day. 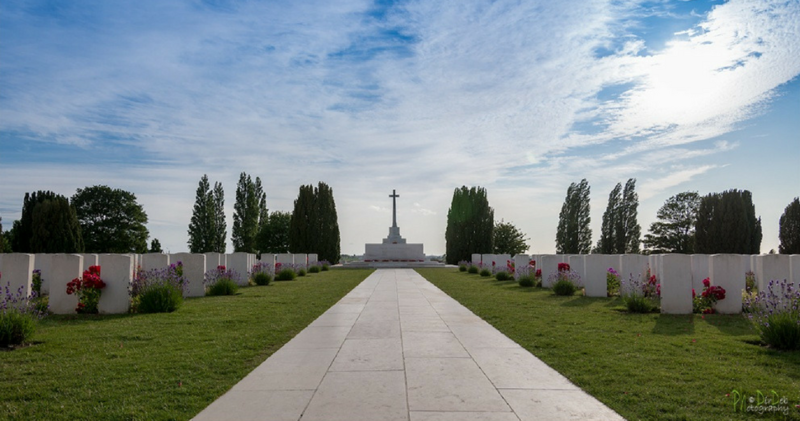 Visit to Tyne Cot – as advised in the August 16th Latest News our BUGLE colleague, Ken Fedzin, visited the Tyne Cot Cemetery and Memorial during his recent touring holiday and placed a BUGLE Wreath on behalf of the people and Batley and Birstall to the men remembered there. Ken took quite a number of photographs of the names on the Memorials and the Graves of the Batley and Birstall men who were buried there. If you have a relative associated with Tyne Cot then contact the website via info@projectBUGLE.org.uk and we will forward any relative images. 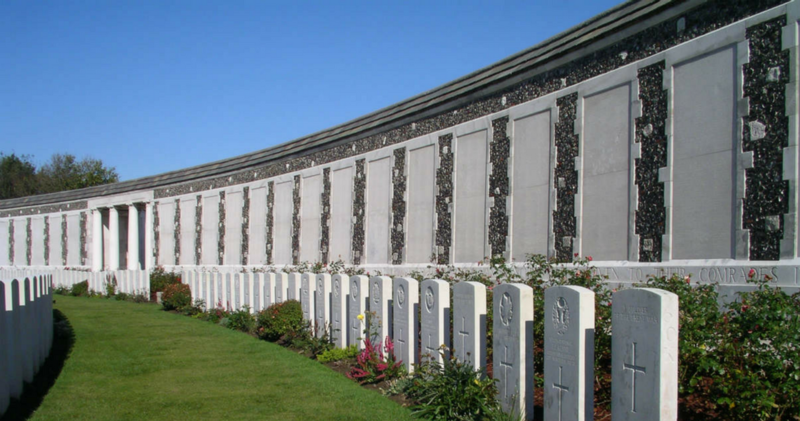 visiting Tyne Cot Cemetery and Memorial Gardens on August 16th. on behalf of the grateful people of Batley and Birstall, West Yorkshire, England. on the Tyne Cot Memorial and in Tyne Cot Cemetery. who gave their lives for King and Country during the First World War. The August Edition of the BUGLE Newsletter and the Poppy List are now available on the website and the Exhibitions in Batley and Birstall Libraries reflect the situation in August 1918. During the August there were TWENTY losses from Batley and Birstall. On MONDAY AUGUST 13th we are holding a Wreath Ceremony at St Paul’s Church, Hanging Heaton for Driver Sam Dixon who died on that date 100 years ago. The Ceremony will follow our well established format and we will meet in the Church Hall – by the Church gate – from 10.30 am. We will be joined by Rev. Martin Naylor and Rev. Val Keating. Those who follow BUGLE might remember that in May we remembered Private John Bailey Dixon MM – he was one of Sam’s older brothers. As John’s body was killed in action and his body never recovered it seemed appropriate to lay a Wreath for him at Sam’s Ceremony. The brothers were two of five who served in the First World War and our research has found grandchildren from Sam and John and the youngest brother Eli. I am delighted to advise that nine grandchildren from these three men will be joining us for this Ceremony – they will be traveling from Cornwall, Tadcaster and Batley. Some have never met …… it should be quite an occasion. We hope you might be able to join us. should give those interested time to plan their attendance. Batley War Memorial but who were buried in nearby towns. Spen Valley Royal British Legion and Spen Valley Historical Society. forecourt to the Chapel’s War Memorial. Following a number of requests to distribute their stories down this route I attach the Soldier Stories for the TOWNLEY brothers. Willie, the older of the two died in hospital in France on June 1st 1918. George survived the war and later in his life he wrote an account of his war experiences and what life was like when he returned to Civvy Street in Batley. This is the first time this account has been available outside of his immediately family. Through the efforts of Batley History Group a new Blue Plaque will be unveiled at Batley ZION – Central Methodist Chapel – on Wednesday June 20th at 11.00am. All are welcome. This is the second in a series of Blue Plaque initiatives being managed by Peter Connor on behalf of BHG. June 21st marks the 100th anniversary of the death of 18 year old Percy Boden. He was captured with weeks of going to the front and died in hospital in Hamburg following an operation for Appendicitis. His Soldier Story is attached. The latest Editions of the BUGLE Newsletter and the Poppy List are now available on the website and the Exhibitions in Batley and Birstall Libraries have been updated to reflect the situation in June 1918. During the month there were NINE losses from Batley and Birstall. Last month in the Newsletter we reported on the death of Private Percy Link of the Manchester Regiment. 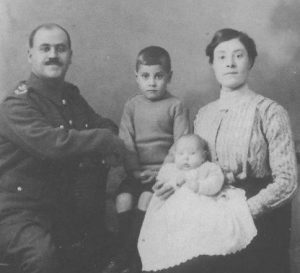 The article was read by members of his direct family and they kindly sent a photograph of Percy with his wife, Elsie, and their young son Norman. The photograph has been included in the June Newsletter. On May 27th 1918 Ex-Private Fred Avison of the Durham Light Infantry died at home in Batley. He had been a Reservist for over a year but was discharged from the Army due to poor health. He died eight months after his discharge and so he had civilian status at the time of his death. This being the case he was not included in the Commonwealth War Register but, at his family’s request, his name was added to the Batley War Memorial. It seemed appropriate that his passing should be noted and a Wreath was placed on his grave on the Anniversary date. Fred Avison’s brother, Private Charles Avison of the East Yorks. Regiment was killed on April 17th 1917 and both soldier’s stories have been added to the BUGLE website. Additionally included in LATEST RELEASES are two other stories. Brothers Willie and George Townsley both served in France. Older brother Willie died at Etaples on June 1st 1918. Younger, George returned home at the end of the war. Willie’s Soldier Story is included in LATEST RELEASES. In 1977 George Townsley wrote of his experiences in the war and he told the story of returning to Civvy Street and picking up his life in Batley. He married, had a family and lived well into his eighties. This personal account has never been read outside the Townsley family. But George’s daughter has given us permission to lift the story and add it to the BUGLE records. If you read Willie’s story, at the end there is a link direct to George’s article. But you can find George’s article directly by looking on the website at the TAB “Soldier’s/Sailor’s Stories” – first file “THOSE WHO CAME BACK”. It is a remarkable insight into life in Batley after The First World War. The latest Editions of the BUGLE Newsletter and the Poppy List are now available on the website and the Exhibitions in Batley and Birstall Libraries have been updated to reflect the situation in May 1918. During the month there were SIXTEEN losses from Batley and Birstall. Sapper Frank JACKSON died on the 15th of the month and he was buried in St Peter’s Church at Birstall. We will be holding a Wreath Ceremony for him on the same date. This will be the first of our Wreath Ceremonies to be held at Birstall Churchyard and I am delighted that we will be hosted by the Church for our event. Usual timings for such an event – 10.30am at the Church with a walk to the graveside for an 11.00am service. We hope many of you will come to support the project in this first Birstall Wreath Ceremony. On May 27th we lost Private John Bailey DIXON MM – yet another Military Medal winner lost in such a short space of time. Private John Bailey DIXON MM. K.O.Y.L.I. John Bailey Dixon was born in March 1882 and lived in Leeds Road, Dewsbury. He was one of four brothers who served in WWI – two of the brothers died. In July 1910 John married Grace Ladyman Bramley and they subsequently had two children – Norman and Laura. This photograph shows John and Grace with their children – Norman and Laura. Norman was the father of Grahame and Keith Dixon who live in Batley. Project BUGLE is indebted to them for providing and giving permission for us to use the photograph and for giving access to copies of their Grandfather’s letters to his wife. John Dixon joined the forces in September 1916 and went to the front the following January. He was involved in a great deal of action and sent regular letters home to ‘his Dear Wife’. A very modest man – he wrote on May 4th 1918 …..
“My Darling wife and children and sister. Times changes and we have to do with the times but not with those we love, for the longer I am away from you and more I long to see your dear faces. …… It makes me think that this terrible war is never going to finish and it makes me more dissatisfied with our life’s journey. I try to keep my trust in God but when we have been so happy together it makes it hard. ….. From your and ever lasting husband. So goodnight and God bless you all”. This was his last letter. He was reported missing on May 27th. His body was never found and it was over a year and three months before he was officially declared dead and his family could finally receive his pension. Again thank you to Grahame and Keith for allowing us today to read these family treasures. It is pleasing to record that both the Dewsbury Reporter and the Batley News devoted a full page in their Thursday April 26th edition to tell the story of the five Military Medal holders who were killed one hundred years ago. We are pleased the soldiers’ stories received such a wider audience. And, following that publication, we have been contacted by the family of Private Fred Hill MM asking for more information about him. More might follow ….. The latest Editions of the BUGLE Newsletter and the Poppy List are now available on the website and the Exhibitions in Batley and Birstall Libraries have been updated to reflect the situation in April 1918. April 1918 was another terrible month for local casualties with SIXTY men lost from Batley and Birstall – and many many more were injured and took no further part in the war. 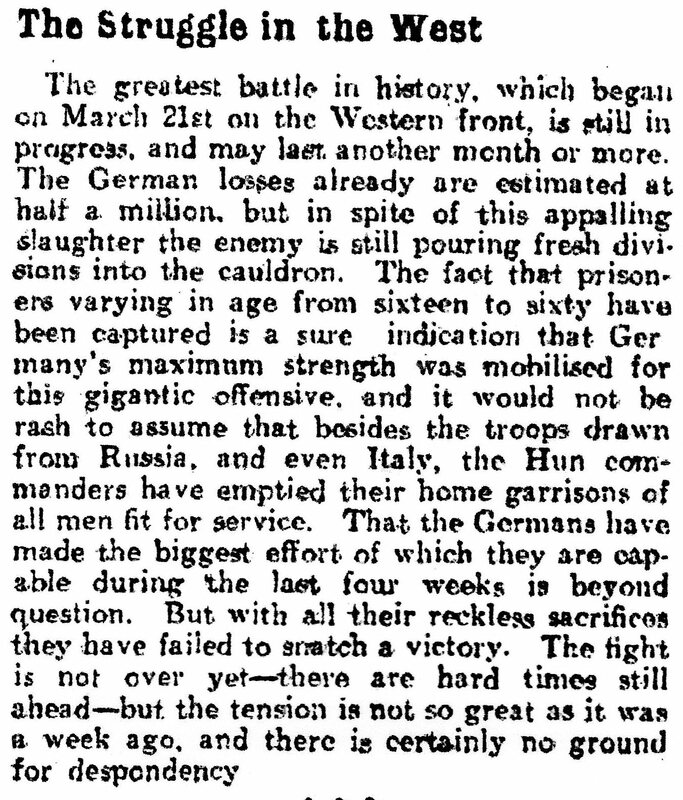 In the two months of March and April we lost over ten percent of the total loses in the whole war. 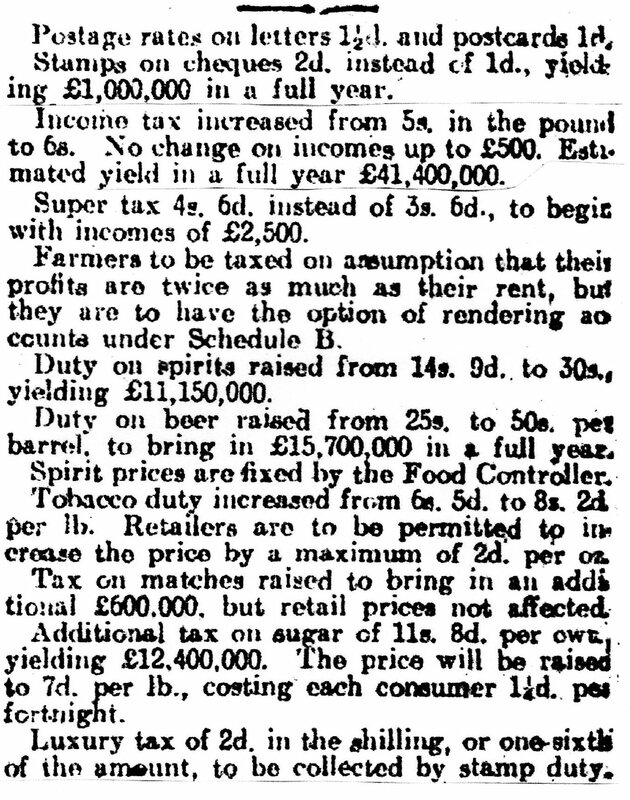 The Batley News set out the position that, despite all the losses suffered, perhaps there was room for hope …. This plaque was situated just inside the main door of the original store just off Commercial Street. The plaque is now kept in the Co-op Archives in Rochdale and we are trying to arrange it to form part of an exhibition later in the year. There is also a montage of the images of the eleven soldiers listed and a copy is shown in the Soldier Story names below. His window took the form of a Roll of Honour for the twenty two men associated with the church who were lost in the war. A photographic image is also shown in the Soldier Story referenced below. And just as if losses of husbands, fathers and sons were not enough for those at home to endure the Government took action to help replenish the counties much diminished cash resources. A miserable existence just got worse. But you can help – VOTE for PROHIBITION !!! The latest Editions of the BUGLE Newsletter and the Poppy List are now available on the website and the Exhibitions in Batley and Birstall Libraries have been updated to reflect the situation in March 1918. In February we reported that one soldier from Batley and Birstall had been lost during the month. 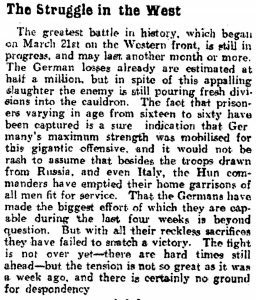 March 1918 was a totally different month – with FORTY men killed and many others badly wounded. Through his research Peter Claydon came across a review of the book “FIVE DAYS FROM DEFEAT: How Britain Nearly Lost the First World War”. The headline to the article states “A historian as concluded that the French saved Britain from an almost certain rout 100 years ago”. SOLDIER STORIES – two full stories this month. Sergeant Sykes Soldier’s Story in presented in the LATEST RELEASE tab. Lance Corporal Barron is included in the “Drighlington Lads” Roll of Honour that we include in the BUGLE website. (see “Books of Remembrance” tab). This Roll was researched and developed by the late Philip Wheeler who gave all his local research – including his Batley Grammar School book “Batley Lads” – to BUGLE for the website). We are indebted to Tony Slade, who is related to three of the soldier’s on the Drighlington Memorial, who has agreed to update the Soldier’s Stories and add details and photographs that were not available to Philip Wheeler. Lance Corporal Barron’s story is the first update that Tony has produced. We have added (2018) to the title so both versions can be held in place. The latest Editions of the BUGLE Newsletter and the Poppy List are now available on the website and the Exhibitions in Batley and Birstall Libraries have been updated to reflect the situation in February 1918. This was a quieter month in the War – with one casualty – but all hell broke loose in March when we lost over forty local men. The Website has been updated with the short-form Soldier Stories for Gunner Ernest Newsome and Private George Arthur HARGREAVES. More stories will be released mid-month. Part of the challenge of Project BUGLE is the research behind just the names on the Memorials. And this last month had been particularly interesting. We reported in January that Able Seaman Farrar Hill had been lost when his submarine crashed and sank in late January. Researching his story – a steam powered submarine in 1917 – was particularly interesting and the research took us to a Museum in Northern Denmark. And a further link with local history was that his father, also Farrar Hill, became Mayor of Batley 194-50. Gunner Ernest Newsome drowned when his ship sank when it hit a mine as it entered Alexandria Harbour in Egypt. We found relatives in America who knew of him, but nothing about him, and had never seen his photograph. Then it was found that a young Volunteer Nurse had survived the sinking and had written home telling of her ordeal. Contact was made with the granddaughter of the Nurse who lives in Brisbane, Australia and with permission we include that account in this month’s Newsletter. The full Story of these two men will be released shortly – the release has been consistently delayed by further findings. The Nurses story is itself quite interesting. She was a volunteer – from a well to do family. The Government were not keen to taking onboard these young women from privileged backgrounds – with no experience working – but the sheer number of shortages of nurses left them with no alternative. The Nurse’s story had a happy ending – she lived to be 105 years old. NOW – for any who have a particular interest in “NURSING DURING the GREAT WAR” our close neighbours DEWSBURY SACRIFICES is hosting a talk by Tim Lynch at Dewsbury Minster at 7.30pm on February 13th – all are welcome. We have added three Soldier Stories to the website – and they can also be found in the LATEST RELEASES section. Private Horace RHODES died on December 30th 1917 and a Wreath Ceremony was held today at Batley Cemetery. Rifleman Albert Edward BARBER died on January 22nd 1918 and a Wreath Ceremony was held today at Batley Cemetery. These stories will remain on the website under the Soldier Stories tab but they will also remain under LATEST RELEASES for 90 days. The Team would like to wish all BUGLE followers a happy, healthy and trouble free 2018. We, we know that the Great War would end in another eleven months – but those living the experience had no reason to feel optimistic. This month’s Newsletter very vividly tells of the thinking of that time, in January 1918, under the leading article ‘THE UNKNOWN FUTURE’. And ends … “So far as we can see, the year that is before us will involve greater difficulties and heavier burdens than we have hitherto had to bear”. 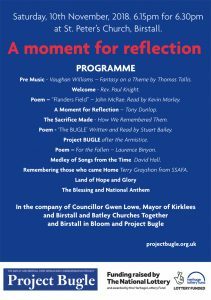 It is poignant to record that whilst in the life of Project BUGLE – so far – we have remembered over 500 men from Batley and Birstall lost to the conflict – but there will be nearly 350 more men who died from January 1st 1918 through to the end. For many many people the impact of the war had yet to reach them. For January 2018 – – – we have released the Project BUGLE Newsletter and this month’s Poppy List. The exhibitions in both Batley and Birstall Libraries reflect the happenings of the new month. Additionally, we have published, and placed on the website (LATEST RELEASES), the shorter version of the Soldier’s Story for .. It was regrettable that we couldn’t hold the planned Ceremony for Pte. Rhodes on December 30th. However, earlier this week, we placed the Wreath and the BUGLE Marker on his grave and we will tell his story and complete the Ceremony at the next Wreath Ceremony. 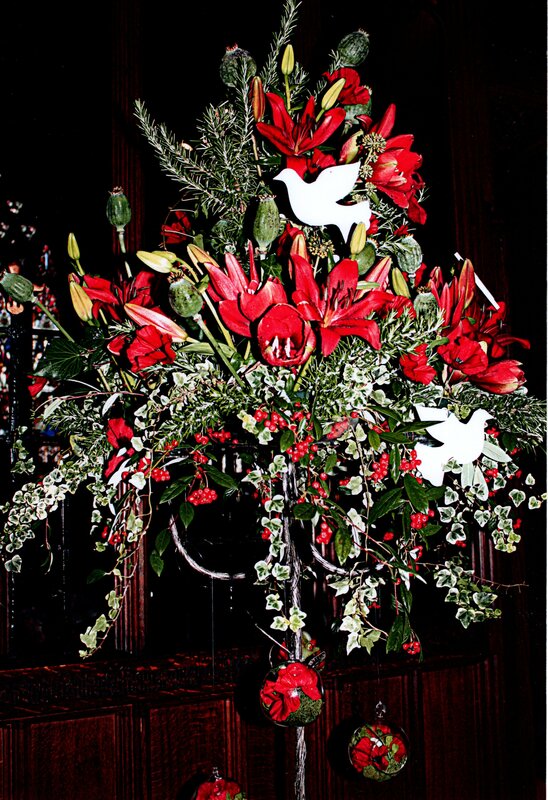 Therefore on Monday January 22nd we will meet at the Chapel in Batley Cemetery at 10.30 for an 11.00am service with Wreath Ceremonies for …..
All are welcome and teas and coffees will be available both before and after the proceedings. For the Project BUGLE TEAM.